This iExpression is a variant of the 'Throw 3D' iExpression in which the thrown object cannot only bounce of the ground but also bounce of some walls. There are four different walls available (two in X and two in Z dimension). 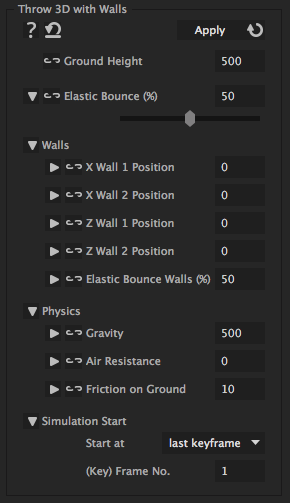 Besides the position of the walls, you can also specify how elastic the thrown object bounces of the walls. In case you need less walls, you can place some walls behind the scene or far away, where they have no effect. determines the height of the ground level at which the object bounces. This value should not be animated. how elastic the object bounces from the ground. 100% means that the object behaves like a bouncing ball, 0% means that it does not bounce at all. is the position of the first wall, at which the thrown object may bounce in X direction. This value should not be animated. is the position of the second wall at which the thrown object may bounce in X direction. This value should not be animated. is the position of the first wall at which the thrown object may bounce in Z direction. This value should not be animated. is the position of the second wall at which the thrown object may bounce in Z direction. This value should not be animated. how elastic the object bounces from the walls. 100% means that the object behaves like a bouncing ball, 0% means that it does not bounce at all. determines how fast the thrown object falls down i.e how strongly it is attracted by gravity. determines how much the object slows down (in horizontal direction) while it is in the air. determines how much the object slows down (in horizontal direction) while it is sliding on the ground. is the frame or the keyframe (depending on the choice of "Start at" option) at which the throw simulation starts. When "Start at" has the value 'last keyframe' this option is ignored.